Eye exams should be performed by ophthalmologists and not in places that offer a “free visual acuity measurement”, where the eye health of the patient is not guaranteed. A comprehensive evaluation of your vision is a guarantee for your eye health. Visual acuity measurement is an exam that can determine the degree of myopia, astigmatism or hyperopia that a patient suffers. 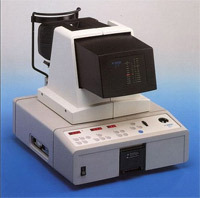 It is performed with an Allergan Humphrey brand computerized refractometer. It is also used in the calculation of contact lenses, should a patient require them. Many patients arrive to our offices with blurred vision. In many cases, this may be easily solved with a pair of glasses; in other cases the diagnosis might be cataract, glaucoma, or retinal or optic nerves disorders, requiring a different treatment. That is why we recommend that all our patients suffering from a visual impairment undergo a comprehensive eye exam, and avoid going to places where, for commercial reasons, they offer a “free visual acuity measurement”, without considering the patients total eye health.